There might come a time when, because of illness or injury, you will need to medicate your parrot. It’s a good idea to start preparing for that possibility now, before the need for your bird’s cooperation arises. Several years ago, after I had first gotten Linus, he managed to escape his cage while I was at work. I came home to a complete mess. A quick glance showed that all the other bird’s cages were still closed, so I spent the next several minutes assessing the damage and trying to determine if Linus had gotten into anything dangerous that might require medical attention. It was about 15 minutes before I noticed the blood in the cockatiel cage. My cockatiels had been raised around Abu, a uniquely gentle and patient umbrella cockatoo, who never had shown interest in harming anything besides my laundry basket. I assume that when Linus found his way to the cockatiel’s cage, they went over to greet him, not realizing that Linus did not have the same good intentions as Abu. Whatever took place happened through the bars of the cage. Tinky’s leg and foot were badly injured and I was surprised that an amputation was not found necessary. Still, the injury was serious, and I was sent home with a course of antibiotics that was to be injected into the breast muscle of a squirming, angry little cockatiel twice a day. Cockatiels are so little and the needle on the syringe was so big. It was actually a gauge used for human medical needs and it seemed like the equivalent of pushing an ice pick into the muscle tissue of a human. Tinky was a trooper and we only had a problem with one failed injection. After I got more comfortable with the process, I began to realize how much more efficient the injections were, in this circumstance, than administering the medication orally would have been. So much can be lost in the struggle between an unprepared bird and owner, that its effectiveness can be substantially diminished. Years later, Linus contracted AGY, a serious, and very contagious fungal infiltration, which required oral medication – three 30 day courses over a period of about nine months. The combination of the symptoms of the disease and spring hormones left him disagreeable on a good day – a raging demon on a bad one, and there was this medication that I HAD to get into him. It was bright yellow, thick, chalky and bitter tasting. Even though it had been “cherry flavored”, it was just horrible to the taste and I braced myself to be showered in it on the first dose. To my huge surprise, he just swallowed it, and continued to do that with each subsequent dose through every course of treatment. This is not very Linus-like behavior. I got really lucky. 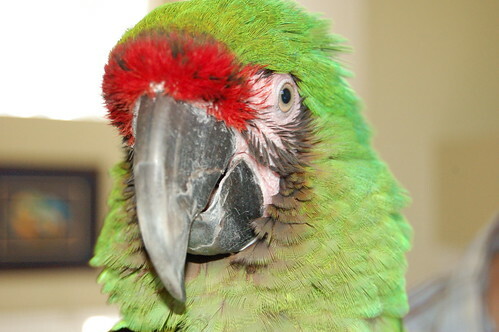 I was not prepared, nor had I given any previous thought to preparing any of my parrots for what happens during times of ill health. How do you prepare for effectively delivering oral medications? First, be sure you understand the nature of the bird’s illness and what the prescribed medication is intended to achieve. Follow your vet’s directions for application to the letter and be certain to administer all doses, even after the bird appears to be feeling better. Know what side effects might be experienced. 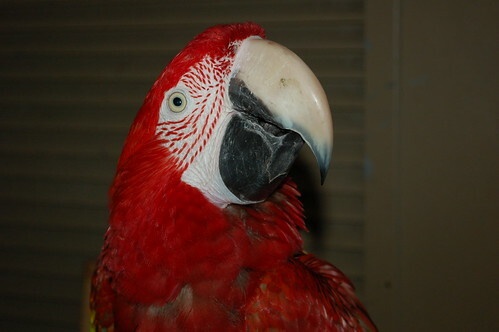 While it may be necessary to towel your parrot to give the needed doses of medication, it is also very stressful for her. If there is a way to achieve this goal without causing distress, it only makes sense to take this route. Target training your bird for just this sort of situation is an excellent way to prepare yourself. Try offering fruit juice or liquefied fruit as the reward in a syringe (no needle!!) or an eye dropper. A friend of mine targets her bird directly to a filled syringe. There are several great videos on this site teaching you methods of target training. Occasionally, we find it necessary to medicate our feathered friends. Here are some pointers to help you with this task. With your other hand, grasp the medicine syringe and place the tip into the left side of the bird’s mouth. Depress the plunger and squirt the medicine toward the back of the bird’s throat. Wipe excess medicine from the bird’s beak. Carefully immobilize the bird’s head to prevent further tissue damage to your body. 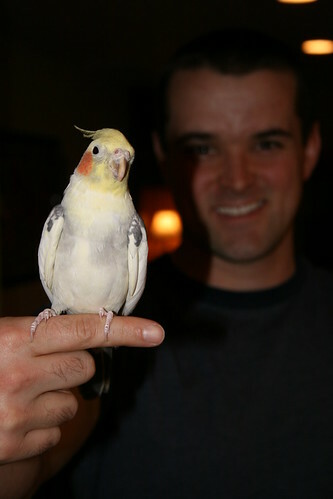 Attempt to break the “Vulcan Death Grip” and remove the bird’s feet from your hand. putting your tender flesh in mortal danger again. Try to stop trembling in fear and pain. Place the tip of the syringe into the left side of the bird’s mouth. Wipe excess medicine out of your eyes. Release the bird and squirt medicine in the general vicinity of its face. Some medicine may actually go into the mouth. The rest will be absorbed by osmosis. Spend the rest of the day attempting to regain the bird’s affection with yummy snacks and new toys.